These small bulbs produce masses of compact spikes of flowers about 6" tall. Most are in shades of blue , sometimes with a strong contrast between the top and the bottom of the flower. There are white forms. Some of the yellow ones are scented. All are excellent in pots where they mix well with tulips and anemone blanda. Some varieties can be grown indoors but are best if they are first rooted outside. Most are trouble free increasing freely in any dry soil. The most vigorous varieties are useful for growing round the base of a tree or they can even be naturalised with daffodils in grass . The bulbs are planted in the autumn 4" deep and 3" apart in any reasonable soil in sun. An exceptionally free-flowering grape hyacinth with many large spikes of fully double flowers making an impressive display. It is one of the best for pots - I use it with small tulips and daffodils for a long lasting pot. I then pout the used bulbs out in the garden to edge my rose bed. Sterile and clump forming. A compact grape hyacinth producing masses of ’fat’ flowers. They open creamy green then mature to white. It is excellent in pots and for bringing indoors. Slower to increase than many. Very popular at Chelsea Show. Plant the bulbs in the autumn in any soil inm sun. Summer dormant. 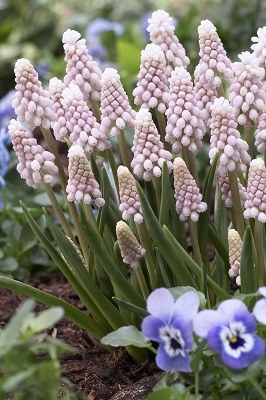 This well known grape hyacinth has beautiful large flowers of deep cobalt-blue with a white rim. It is excellent as companion plants for other spring bulbs in borders or pots. Vigorous emough to naturalise in grass. Plant the bulbs in the autumn, Summer dormant. (Hyacinthus azureus) A beautiful grape hyacinth with compact azure-blue flowers and neat foliage. Recommended for front of a sunny border or rock garden. It really is an amazing colour and very dwarf. This new grape hyacinth is one of the best. It is a compact bulb producing masses of beautiful sky blue, scented flowers. The lop of the flower in slightly lighter. Excellent in pots and for bringing indoors. Slower to increase than many. It is probably the best for underplanting tulips and daffodils in pots. Plant the bulbs in the autumn. Summer dormant.